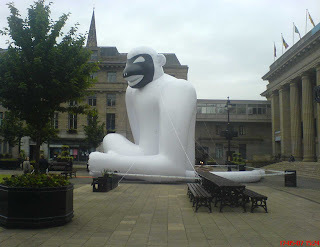 If you were passing the City Square yesterday, you could not help notice the appearance of a 30ft inflatable monkey (see right). Six of these have appeared round Scotland to officially launch the Six Cities Design Festival I have referred to in previous blog entries. You can see the news item about this from Dundee on stv news last night by clicking the headline above. Was interviewed yesterday by Nick Henderson of Roars Not Whispers – a joint project between the Scottish Youth Parliament and Oxfam in Scotland. The project is a youth led initiative focusing on social justice issues which are important to young people, locally, nationally and internationally. Nick and his colleague are making a video about different attitudes to poverty in Dundee and they’ve promised me a copy of the completed video in due course. Meantime, if you want to know more about Roars Not Whispers, you can contact Nick at nickhenderson@rnw.org.uk. Lastly, the latest Dundee Partnership Digest outlining the latest activity of the Dundee Partnership is now available at : http://www.dundeepartnership.co.uk/file.php?id=1528. Towards the end of last month, I mentioned Dundee’s participation in the Six Cities Design Festival (click on headline above to view story). The Six Cities Design Festival has finalised its programme of events and exhibitions. The festival will celebrate and promote design in all of Scotland’s six cities, and Dundee is playing a leading part. By checking http://www.six-cities.com/ you can have a look at the varied line-up and book a place for any of the events that might take your interest.